JetBlue‘s founder, David Neeleman, is reportedly launching a new US-based low-cost airline called Moxy. According to Airline Weekly, Moxy has secured an order for 60 Bombardier CS300 airliners. Neeleman’s new airline plans to commence service in 2020 and is expected to have all 60 of its CS300s in the fleet by 2024. The airline is set to connect major metropolitan areas using smaller, secondary airports. Moxy is working to raise $US100 million in startup capital. JetBlue’s founder, David Neeleman, is reportedly launching another low-cost airline in the US. According to the trade publication Airline Weekly, Neeleman’s new venture is to be called Moxy and will be aimed at smaller secondary airports. 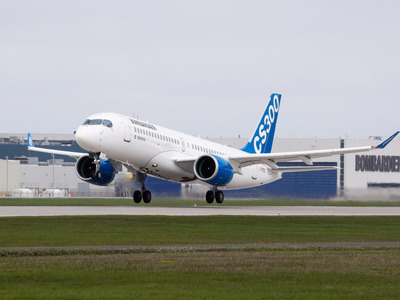 Moxy has already placed orders for 60 Bombardier CS300 airliners and is working to raise $US100 million, Airline Weekly reported, citing people familiar with the venture. Funding for the new airline is expected to come from several sources including the former Air Canada CEO Robert Milton, the former ILFC CEO Henri Courpron, and Neeleman himself. Neeleman declined to comment on the matter. According to the trade journal, Moxy plans to commence service in 2020 when Bombardier is to deliver the first of its new airliners. All 60 Bombardier jets are expected to be delivered by 2024. Moxy will target smaller, lower-cost, secondary airports located near major metropolitan transportation hubs. These include the Stewart and Republic airports near New York City as well as airports in Milwaukee and Gary, Indiana, to service Chicago. Baltimore and Trenton, New Jersey, are also prospective destinations. Should Moxy get off the ground, it would be latest in a long line of airline endeavours for the Brazilian-American serial entrepreneur. Neeleman helped found a series of successful airlines over the past three decades including Morris Air, which was sold to Southwest Airlines; WestJet; JetBlue; and Azul. He’s also running Portugal’s national airline, TAP.